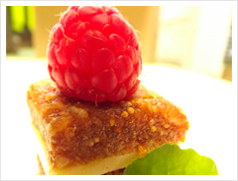 That since 2003 procuce dried figs and derived products with our own brand from our raw material of our organic farms. A year later we started producing our unique fig cake and, in 2006, our Fig Bombón was launched, made with highest quality figs and chocolates. From the beginning, our efforts were focussed on the international market, regularly attending tradeshows like Alimentaria Barcelona, BioFach Nüremberg and Sial Paris, global references in food industry, organic and gourmet products, respectively. 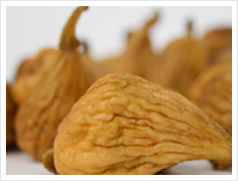 Our dried figs variety, called "Calabacita" originates from Almoharin, a small town closely linked to Arab culture and the cultivation of figs. 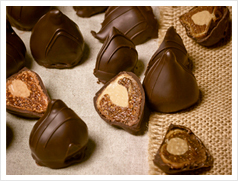 They have a unique flavour and texture, which allows them to have a wide range of culinary applications achieving excellent pairing with ingredients like cinnamon, chocolate, pralines and so on. The dried figs is a fruit rich in comples carbohydrates, source of iron and high in dietary fiber, potassium, magnessium and calcium, essential for the organism. Spectacullar Fig Bombón made with our "Calabacita" figs, stuffed with almond praline and covered with finest Belgian chocolates. We only use high quality organic ingredients. 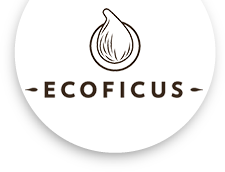 Ecoficus fig cake is made with different flavours: Orange, liqueur, goji, blueberry... It is ideal with cheese or foie. 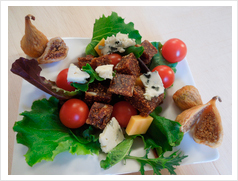 Delicious salad made with our organic fig cake, ideal as tapa or dessert.